This recipe has all the flavours of summer vegetables, is beautifully light and it doesn't need any stock. You can change the vegetables to what’s in the garden or available. Especially once broad beans and peas are in season, these make a lovely addition. All the vegetables need to be cut to a similar size so they cook in the same time. Norfolk cheese maker Katherine Temple makes a wonderful hard cheese similar to Parmesan which works well in this recipe. In a large saucepan or sauté pan, soften the onions in the butter. Add the garlic, carrots, turnips and the potatoes and cook for a further 3 minutes. 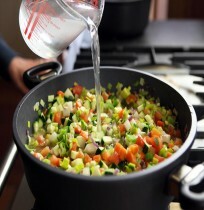 Then add the leek and celery, cook for a couple of minutes and lastly add the tomato and courgette. After a minute pour in the water and boil for 5 minutes until the vegetables are totally cooked. 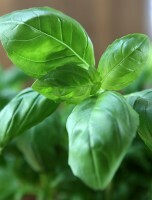 Remove from the heat, season and add the pesto and serve with finely grated cheese to add as you wish. 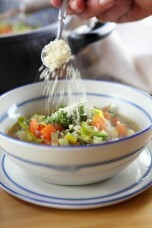 Process all ingredients until smooth and season with salt and freshly ground black pepper. This will keep in the fridge for up to four days.